From 乌鲁木齐市Wulumuqi (Urumqi) city's 南郊客运站South Long Distance Bus Station I took the 2.5 - 3 hour ride to 吐鲁番Tulufan (Turfan or Turpan), a small region whose citizens are mostly of the 维吾尔族Uygur ethnic group (about 70%). 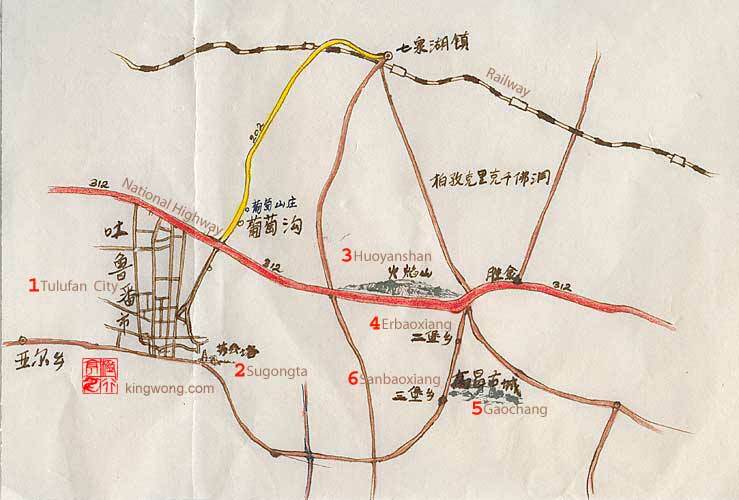 During the peak days of the 丝绸之路时代Silk Road (or Silk Route) Era, from the 汉朝Han Dynasty (206BCE - 220AD) to the early days of the 唐朝Tang Dynasty (618 - 907), Tulufan had been one of the main oasis towns along the northerm rim of the 塔克拉玛干沙漠Taklamakan Desert. And before the spread of Islam after the end of the Tang, this region was one of the main centers of Buddhist culture. Pilgrims on their way to India inevitably stopped here for a few days before moving onward. In its glorious days, 高昌城Gaochang (Qorakhoja) had hundreds of Buddhist temples and living spaces to service the monks. And it was here that the well-known Tang monk and traveller, 玄奘Xuan Zhuang (602 - 664), spent a month at the insistance of its devout ruler, who was a 汉人Han. Today, you can get a glimpse of the ancient city at the 高昌故城Gaochang Gucheng Ruins in the 二堡乡Erbaoxiang Township, which is about a half hour ride from the city center. Right on this township is also the phenomenal 火焰山Huoyan Shan (Flaming Mountain). To the west of the mountains are the famous grape valleys and villages that produce the very sweet grapes that one will find everywhere. In Tulufan city itself there is the 苏公塔Sugong Ta (Emin Minaret), which was built during the early 清朝Qing Dynasty (1644-1911). The holy site is about 15 minutes public bus ride away (2 km). I spent some time trying to capture a good image of her. The children are playing with water from an underground water channel known as the Karez. The karez is an ancient method, probably originates in the Middle East, used to channel water from ice-capped mountains to local areas. It is made up of reservoirs, wells, above-ground canals and underground channels that relays the water to destinated areas. The big girl asked if I may take their picture, so I gathered some of the children and took a formal group picture. The kid proudly held up a piece of paper which I assumed was money. Every household seems to have at least one of these beds or platforms for resting and drinking. These furnitures are usually carpeted. 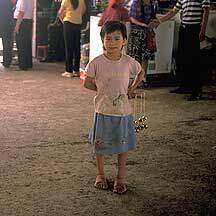 The little girl sells bells to tourists at the entrance building to the 高昌故城 Gaochang Ruins. Kids posing on the 高昌城墙 Gaochang city wall. One of them was carrying my rucksack. Kids posing beside the 高昌城墙 Gaochang city wall. The two camels soon got uncomfortable with all the activities close to them. Looming in the background is the contorted 火焰山 Huoyan Shan. The common local way of moving around. Since Tulufan is right on the Tulufan Depression, the second lowest point in the world with a 155 meter dip below sea level, its climate is naturally wacked: Its summers go as high as 39°C (103°F) and its winters as low as 4°C (-16°F); and it averages 20mm of rainwater in a year. Its 明朝Ming Dynasty (1368-1644) name, 火洲Huo Zhou (Fire City), was not picked by accident. Fortunately its people developed or made use of the ingenious karez - a system of canals, reservoirs and underground channels that lead water from the numerous the ice-capped mountains to the grape valleys and the surrounding city areas. It is this abundance of irrigation water combine with the hot and arid climate that causes its grapes to develop a high concentration of glucose. So come here and grab a bag and enjoy a donkey cart ride through the long beautiful roads lined with slender poplar trees. I have written a 《二堡乡游记》travelogue on Erbaoxiang township where the Gaochang ruins and the Huoyan Shan mountains are located.